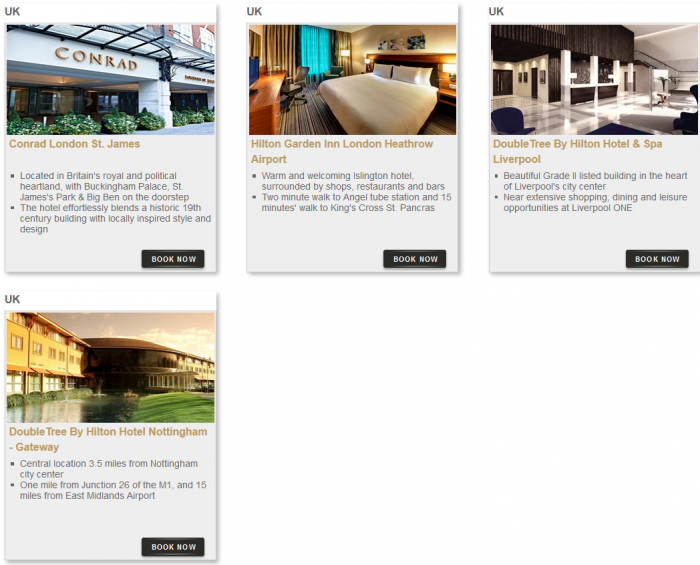 Hilton HHonors has promotion going on for 500 bonus miles at newly opened hotels in Europe, Middle East & Africa. The offer is valid when you book a specific bonus miles package and make sure that the airline that is your preferred double dip partner is not excluded from this offer. Note that you must have your Hilton HHonors Double Dip option set to points + miles and have one of the participating airline chosen as the preferred partner. Bonus Mileage: Earn 500 miles, points or kilometers (depending on the airline program) per night at participating Waldorf Astoria™ Hotels & Resorts, Conrad® Hotels & Resorts, Hilton Hotels & Resorts, Curio – A Collection by Hilton, Embassy Suites Hotels by Hilton™, DoubleTree by Hilton™ hotels and Hilton Grand Vacations™. Bonus miles vary by airline. Per night, guests earn the following on these select airlines: Aeromexico: 1000 kilometers; Air Miles: 25 miles; El Al Israel: 12 Points; Iberia: 750 miles; JetBlue: 250 Points; LAN: 1000 kilometers; Virgin America: 250 Points; and Virgin Atlantic: 1000 miles. Earn 500 miles, points or kilometers (depending on the airline program) per stay at Hilton Garden Inn™, Homewood Suites by Hilton™, Hampton by Hilton™ and Home2 Suites by Hilton™. Bonus miles vary by airline. Per stay, guests earn the following on these select airlines: Aeromexico: 1000 kilometers; Air Miles: 25 miles; El Al Israel: 12 Points; Iberia: 750 miles; JetBlue: 250 Points; LAN: 1000 kilometers; Virgin America: 250 Points; and Virgin Atlantic: 1000 miles. This offer can make sense when the bonus miles package doesn’t come with extra price. So, make sure that you are NOT overpaying for the extra miles. To be eligible for this offer, you must (1) be a member of Hilton HHonors™; (2) have a preferred airline selected in your HHonors profile; (3) book the “Bonus Miles Package” or Plan Code PR09EM/9EM and (4) complete a stay at one of the participating properties during the promotion period. 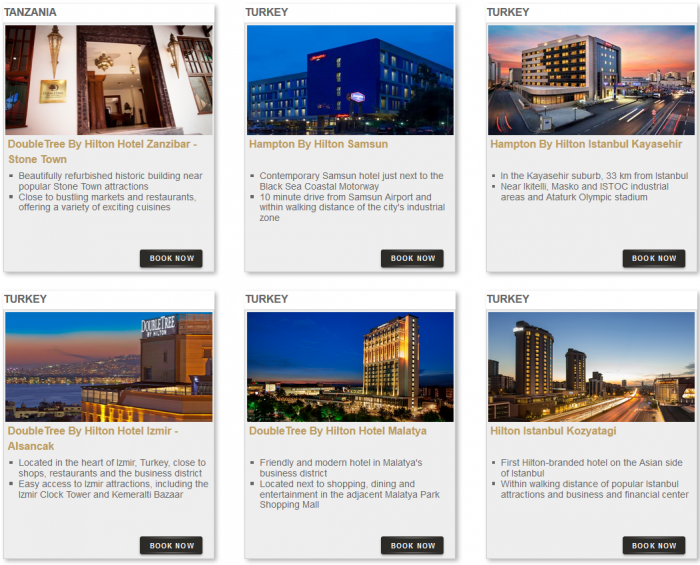 Offer is subject to availability at participating properties in the Hilton Portfolio. Rates do not include taxes, gratuities, incidental charges or resort fees (if applicable). Each hotel’s change and cancellation policy varies. Please contact the individual hotel to confirm its policy. Offer components are non-transferable or redeemable for cash, and cannot be applied toward future stays. This offer may not be combined with other select promotions, offers or discounts and is not valid for groups. Other restrictions may apply. If you are making this reservation by phone, please call our Internet Customer Center at +1-800-HHONORS or view a complete list of Hilton HHonors Reservations phone numbers. When booking by phone, please request “Bonus Miles Package” or Plan Code PR09EM/9EM. Bonus Mileage: Earn 500 miles, points or kilometers (depending on the airline program) per night at participating Waldorf Astoria™ Hotels & Resorts, Conrad® Hotels & Resorts, Hilton Hotels & Resorts, Curio – A Collection by Hilton, Embassy Suites Hotels by Hilton™, DoubleTree by Hilton™ hotels and Hilton Grand Vacations™. Bonus miles vary by airline. Per night, guests earn the following on these select airlines: Aeromexico: 1000 kilometers; Air Miles: 25 miles; El Al Israel: 12 Points; Iberia: 750 miles; JetBlue: 250 Points; LAN: 1000 kilometers; Virgin America: 250 Points; and Virgin Atlantic: 1000 miles. Earn 500 miles, points or kilometers (depending on the airline program) per stay at Hilton Garden Inn™, Homewood Suites by Hilton™, Hampton by Hilton™ and Home2 Suites by Hilton™. Bonus miles vary by airline. Per stay, guests earn the following on these select airlines: Aeromexico: 1000 kilometers; Air Miles: 25 miles; El Al Israel: 12 Points; Iberia: 750 miles; JetBlue: 250 Points; LAN: 1000 kilometers; Virgin America: 250 Points; and Virgin Atlantic: 1000 miles. A “stay” is defined as the total number of consecutive nights spent at the same hotel, whether or not a guest checks out and checks back in again. There is a cap on the miles to be awarded during the promotion period. Airline Miles accrued and awards issued are subject to the Terms and Conditions of each participating airline’s reward program, as applicable. For details on the participating airlines, please click here. The following airlines are not participating in this offer: Air Asia Big, Air China, Air New Zealand, All Nippon Airlines, Asiana Airlines, Eva Air, British Airways, Cathay Pacific Airways, China Eastern Airline, China Southern Airlines, Garuda Indonesia, Hainan Airlines, Japan Airlines, Jet Airways, Kingfisher Airlines, Korean Air, Malaysia Airlines, OK Cashbag, Olympic Air, Qantas, Sri Lankan Airlines, Singapore Airlines, Thai Airways International, Vietnam Airlines and Virgin Australia. Please allow up to six weeks after the promotion has ended for bonus mileage to be credited to your HHonors account.